Bluish-green and big, about 64 times the size of Earth,1 Uranus is the seventh from the Sun of the nine known planets in our solar system. Unusual in many ways, Uranus and its moons pose big problems for evolutionary theories of planet formation, and can be seen as an exciting testament to the Creator. Uranus is some four times the diameter of Earth. It would take the equivalent of 64 Earths to fill its interior. 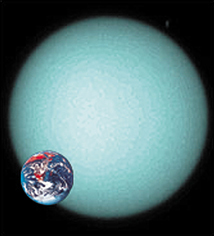 At 19 times the distance from the Sun to the Earth, Uranus is so far away that it takes 84 Earth-years to orbit the Sun once. Barely visible to the naked eye, Uranus wasn’t discovered until 1781, when famed British astronomer William Herschel, a Christian, noted an uncharted bright object traversing an area of sky he was studying. This situation is impossible, according to evolutionary ideas about the formation of the solar system, namely that the planets condensed from a rotating nebula. Uranus cannot have formed this way naturally. What then is the evolutionists’ solution? Most of them believe that Uranus did actually form the ‘correct’ way, i.e. as according to evolution, but then was subsequently knocked over during a collision with another planet, supposedly the size of the Earth. Indeed, ‘Models for the development of the solar system cannot produce such an orientation without invoking a collision with another object.’3 How feasible is this explanation? First of all, Uranus’s orbit shows no sign of such a catastrophic collision. Its orbit is one of the most circular of all the planets (only Venus, Earth and Neptune have orbits that are more circular). A collision would have more likely resulted in a more elliptical orbit. Also, Uranus’s orbit lies more closely within the ecliptic plane than any other planet except Earth. A massive collision should have disturbed the planet’s orbit more than this. 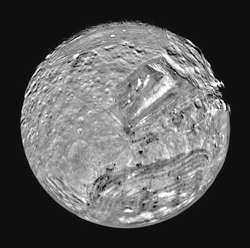 Top: Ariel, one of the moons of Uranus, has a diameter of 1,160 km (725 miles). The smallest surface feature that can be seen in this image of its southern portion, taken from a distance of 130,000 km, is approximately 2.4 km across. Ariel’s surface displays a complicated history. 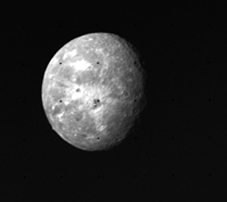 Above: Oberon, 1,523 km in diameter, is the most distant of Uranus’s major moons. The dark spot to the right of middle is the crater Hamlet, with a diameter of 206 km. Finally, this idea of a catastrophic impact implies more than a little hypocrisy among the evolutionists. Christians are mocked by evolutionists for accepting the Biblical account of a global Flood (an event for which there is abundant physical evidence), because it was a one-time catastrophe. We are told that such catastrophes are unrepeatable, and are therefore ‘unscientific’. Yet here we see that evolutionists are allowed to invoke one-off planetary catastrophes with impunity, to overcome problems within their belief system. 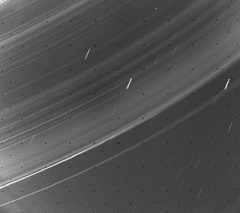 This wide-angle photographic exposure of Uranus’s rings was taken while the spacecraft was in the planet’s shadow. It took 96 seconds, causing the streaks which are background stars. The rings are comprised of microscopic-size particles which are very dark. The image covers an area about 10,000 km (6,250 miles) across. In order to sustain belief in millions of years, evolutionists need to try to overcome the problem that Earth’s magnetic field, like all physical systems, is seen to be gradually decaying. Calculations indicate that it would not be here anymore if the Earth were more than a few thousand years old.8 So they assume a complicated ‘dynamo’ model of planetary magnetic fields, to try to have the field sustain itself from the planet’s motion. Both the strength of Uranus’s field and the fact that its magnetic and rotational axes are so far apart defy the predictions of this evolutionary dynamo model. 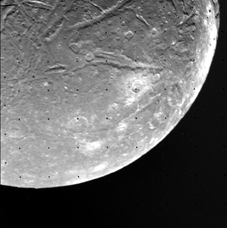 Surprising, too, were the photographs that Voyager took of Uranus’s moons. Voyager discovered more moons than were previously known (we now know of 21). Of the five moons that were known already, Voyager happened to fly very close to the smallest one, a little moon named Miranda. Since Miranda is so tiny (having a diameter of about 480 km, only 14% of the diameter of Earth’s moon), scientists expected it to be a small, boring chunk of ice. Instead, it has proven to be one of the strangest objects in our solar system [see Miranda below]. We see then that Uranus, along with its moons, poses many unique problems for those who don’t want to accept a Creation event. In today’s scientific age, one is often asked how it is possible to be a Christian in light of ‘all that science has discovered’. We see that just the opposite is true—the more we learn, the more we see that indeed, the heavens (along with all the rest of the creation) do indeed declare the glory of God (Psalm 19:1). As measured by volume. Return to text. 82 degrees if measured from ‘south’ of the ecliptic. Return to text. Christiansen, E.H. and Hamblin, W.K., Exploring the Planets (2nd edition), Prentice-Hall Inc., New Jersey, p. 405, 1990. Return to text. For critiques of this idea, see Sarfati, J., The moon: the light that rules the night, Creation 20(4):36–39, 1998; Oard, M.J., Problems for ‘giant impact’ origin of moon, J. Creation 14(1):6–7, 2000. Return to text. 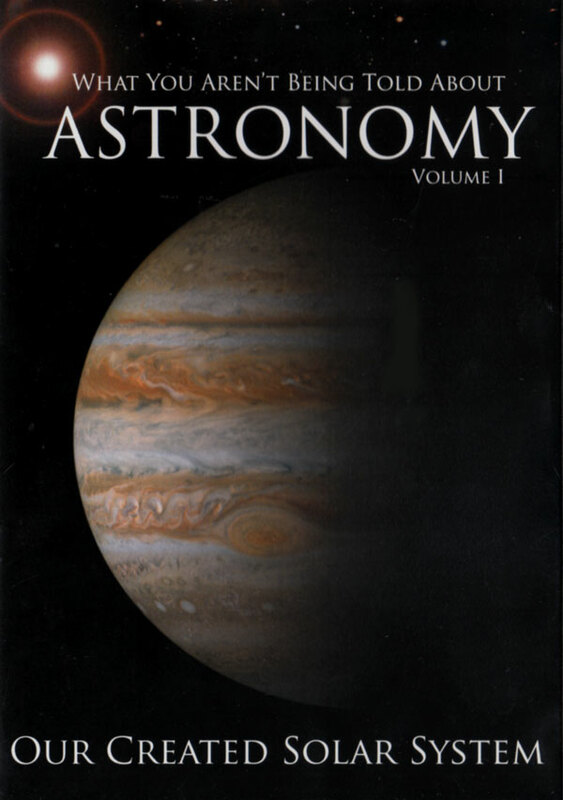 See Henry, J., The energy balance of Uranus: implications for special creation, J. 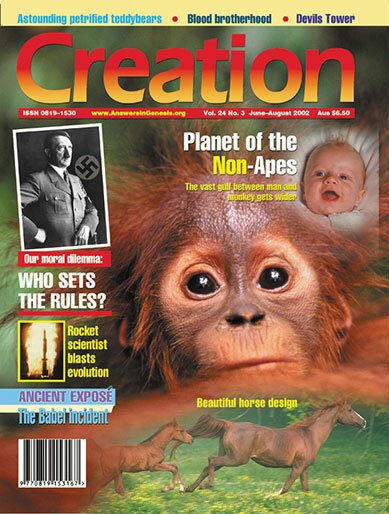 Creation 15(3):85–91, 2001, for an in-depth discussion of this topic. Return to text. Ref. 3, p. 406. Return to text. See Humphreys, R., Beyond Neptune: Voyager II supports creation, Impact 203, May 1990, icr.org; and Humphreys, R., The Creation of Planetary Magnetic Fields, Creation Research Society Quarterly 21(3):140–149, December 1984, creationresearch.org, 26 February 2002. Return to text. Reversals do not solve the problem. See Sarfati, J., The earth’s magnetic field, Creation 20(2):15–17, 1998. Return to text. With one sheer cliff reaching nearly 10 km (6 miles) high, Miranda has some of the most dramatic terrain in the solar system. Heavily-cratered plains alternate with smooth, largely uncratered areas laced with intricate faulting and grooving, forming a spectacular patchwork, and posing all sorts of problems for naturalistic theories. ‘No one predicted anything looking like Miranda’,1 says one evolutionist astronomer. ‘The central problem in modelling the thermal histories of the uranian satellites is accounting for Miranda’,2 says another. 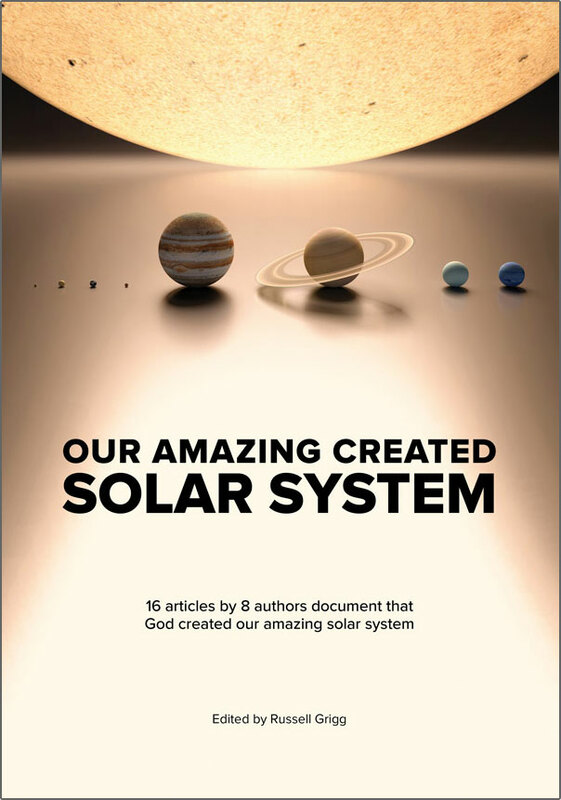 Taylor, S.R., Destiny or Chance: our solar system and its place in the cosmos, Cambridge University Press, Cambridge, p. 86, 1998. Return to text. Croft S.K., Uranus conference abstracts, Pasadena, 5.10, 1988. As quoted in Ref. 4, p. 261. Return to text. See Solar system bodies: Miranda, solarsystem.nasa.gov, 15 January 2002. Return to text. Taylor, S.R., Solar System Evolution: A New Perspective, Cambridge University Press, Cambridge, p. 261, 1992. Return to text.